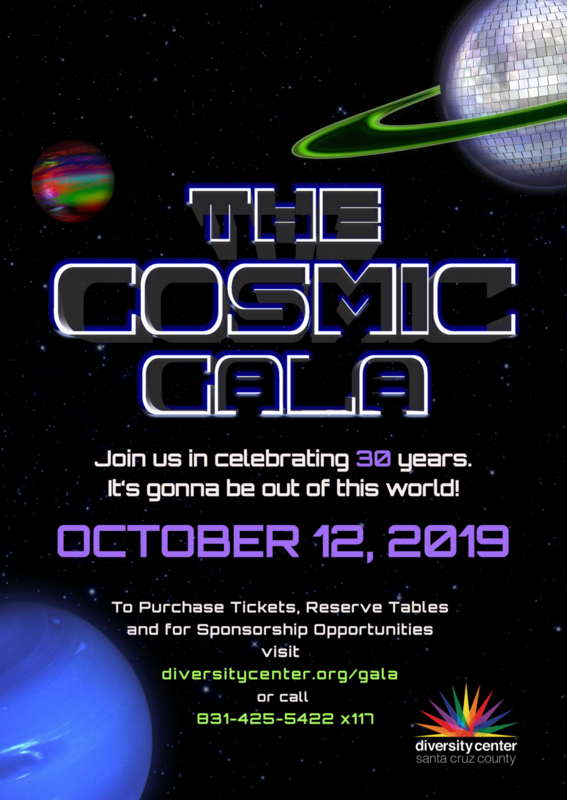 Join us for the Diversity Center’s Annual Gala, October 12, 2019 at the stellar Hotel Paradox. This is our annual fundraiser to support ensuring our programs are free for our LGBTQ+ community. We have lots in store for a grand production that will be nothing less than spectacular! Come together, celebrate and show your support for the LGBTQ+ community of Santa Cruz County at the Center’s biggest event of the year! Our gala is also an opportunity to learn about the many programs that we offer, share ideas, and engage with staff, volunteers and the board. There’s non-stop excitement and fun from the moment you arrive until the end of the night! Enjoy cocktails and conversation with friends and a plated dinner by Hotel Paradox Executive Chef Scott Radek. Check out the high-energy live auction, or try your luck in the casino. The prizes are fantastic, the entertainment is top-notch and you’ll find photo ops at every turn. Get ready for a Cosmic themed After Party that will be OUT OF THIS WORLD! We’ve packed a lot into one fun-filled evening for you! CLICK HERE TO VIEW PHOTOS FROM OUR 2017 GALA - Flashdance! volunteer for our Biggest Event Of The Year! Click here to sign up for a volunteer shift! Be a part of the behind-the-scenes crew that makes the Diversity Center's annual Gala an exciting and memorable event! We are currently looking for 50+ volunteers. Get FREE access to the after party, and help us with our biggest fundraiser of the year which supports all our programs. Roles include registration, back stage security, set up and much more. Read the full volunteer job description by clicking here.